I’ve found it necessary to add my own to the mix because there are a couple of tricks I’ve found to make PyQT windows work with docking and inheriting custom core library classes, which is something we’ve used at the past couple of companies I have worked with. 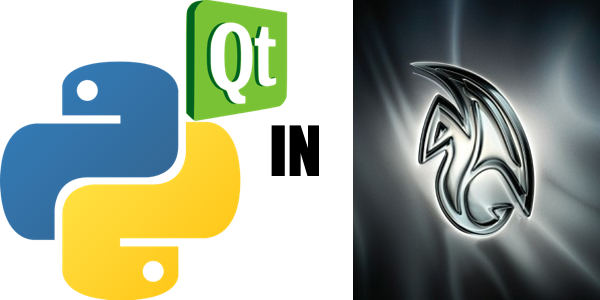 One of the reasons why there are so many posts about using PyQT in Maya is because there are so many different ways to get it done. You can use QT Designer to make .ui files and load them on the fly, like I’m demonstrating here. You can convert the designer files to code or you can code up the entire UI from scratch. * ``base_class``Base Class of widget from ui file. * ``ui_object``	uiObjects of widget from ui file. An enumerated UI path. It’s always good to use relative paths in case they change. (They always do, of course). You’ll need a .ui file created with Qt Designer. Our usual grabbing of the PyQt objects to inherit from in our class call. (Explained many places). I like to catch exceptions wherever I can. Remember to always catch specific exceptions, like ‘IOError’ in this case. It’s pretty poor form to do a general ‘except’. I used the logger.warning call here, I think this maybe a custom level I added to coincide with Maya’s warning printout. There’s also a logger.debug level output telling you which .ui file you loaded. This only triggers when the logger level has been set to debug, of course. I always like to know about what kind of objects I’m dealing with, just type them into the ScriptEditor to get their types. The initialization function must be passed the parent window, hence the ‘parent’ key word argument (kwarg) which calls our utility function mentioned earlier. We need to call ‘super’ to inherit from our base_class which was returned from the uic.loadUiType() earlier. You can call super on the name of your actual class, i.e- super( My Tool ), but it is really running the super inheritance on the base_class so this syntax is fine too. Then you need to call the setupUi() method. Just standard PyQT necessity. Go ahead and use the .setObjectName() method to name your window so you can clear it upon reload. That explains the “simple” example above. Now to add some docking. You’ll notice I catch the creation of the paneLayout. On occasion this will not work, so it’s nice to go ahead and .show() the window anyway. Lastly, let’s add some complexity. If you’re lucky enough to work with a large enough team and/or on a large enough project that has allowed you to spend some time building up core libraries for re-use, you’ll no doubt want to take advantage of your code base and inherit from your core classes so you can use that code in your UI/tool. This can get tricky as you are already inheriting 2 PyQt4.uic classes in order to launch the UI. In this example, I’d like to inherit from MayaCore. When I do, I get a whole slew of helper methods on this class. One of the attributes of the MayaCore class is a logger instance. It is very handy to just call self.logger and have it setup to log in to all the right places and all the right people. * ``base_class``	Base Class of widget from ui file. Must be FIRST! Make sure it is second in the order! Then it is important to instantiate this class but do not use the ‘super’ command! If you do, it will overwrite the ‘base_class’ inheritance and cause you UI to “un-parent” from the main Maya UI. It will then disappear behind Maya when you click anywhere else. It also leads to lots of crashing after you run your tool several times in a session. You’ll know it worked if it prints out ‘testing’ in the ScriptEditor. This self.logger attribute is proof that the MayaCore class has been inherited. Hello Jason. Thank you for your information. The article is informative for me. But I can’t find “common.mayaCore” and “common.core” module. Probably these modules seem to be your original class. Can I download the modules? I would like you to my question. So far, I’ve only added some basic MotionBuilder core libraries to it and a Maya menu launcher but no Maya core libraries yet. Someday I’ll expand on that. For now, you can write your own and use the method above to inherit them into your PyQT tool class. Thank you for your detailed reply. And sorry for my late reply. I understand that “maya.core” module is your original module and it isn’t included your github module yet. But you might expand the module in the future. I’m going to download your module on github. Thanks again!